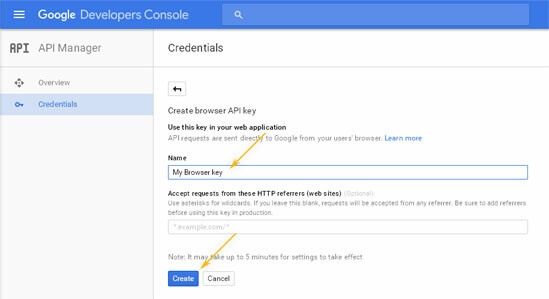 Step-by-step instructions on how to get a Google API Key. In order for the WebTV to use certain Google services like Maps or YouTube integration, it requires a Google API Key. "The YouTube Data API uses a quota to ensure that developers use the service as intended and do not create applications that unfairly reduce service quality or limit access for others. All API requests, including invalid requests, incur at least a one-point quota cost. You can find the quota available to your application in the Developers Console." 2. Project: If this is the first time you use the console (or you don't want to use the credential of an existing project) then create a new project; otherwise, select the desired project to get the credentials for. NOTE: For the screen captures of this tutorial we used a ptroject named "API project". 3. Click Menu icon at the top left. 14. Enter a name for the credentials; additionally, it is strongly recommended to specify HTTP referrers so that other sites can't use your API key. Click Create when done. 15. 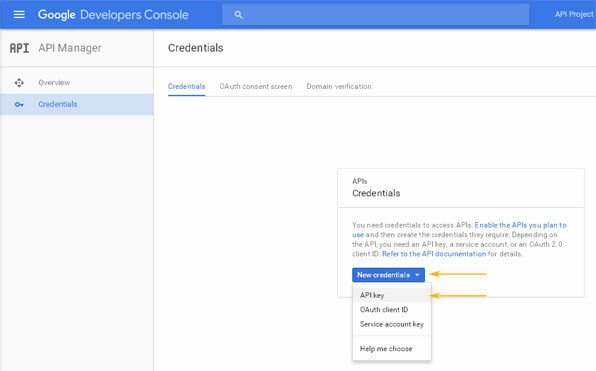 After credentials creation, your API Key will be displayed.